I’ve never met Debbie Kennett, but I feel that I have personally known her for several years. 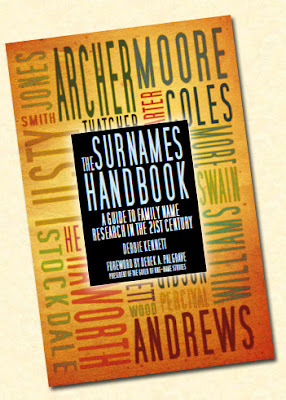 My first encounter with the author of The Surnames Handbook: A Guide to Family Name Research in the 21st Century came after I joined the Guild of One-Name Studies in 2011. Her helpful responses to me and others on the Guild’s list and related Facebook pages specifically helped me in the direction of pursing my own one-name study. Much of the advice that she personally offered is now available in book form from The History Press. While this edition deals primarily with surname research in the British Isles, it is very thorough in this undertaking; however, where she can provide information for research in other geographic regions, Debbie has added these data to the book. Being that my own ONS is traced back to England, I found this book and her advice extremely helpful. The book sets the stage with a forward written by Derek Palgrave who is president of the Guild of One-Name Studies. Debbie then jumps head first into providing the necessary definitions – including one that would be specifically helpful for American audiences who may not be able to discern differences between Great Britain, the United Kingdom, and the British Isles. Her definitions on surnames and forenames also set the stage for what follows. The book contains ten chapters of narrative. Although each provides extensive information, they are written in a style that can be easily understood by the average reader – an attribute that is not always found in other volumes dealing with similar subject matter. Despite an intense amount of research that has contributed to The Surnames Handbook, the book transcends the theoretical realm and contains a very practical approach. Anyone who is considering surname research – no matter how much experience he or she has with the name of choice – will find something that will contribute to his or her own study. Every chapter is complete with Internet URLs that point to specific web sites and databases that will aid in accessing additional specific information. Seven appendices at the end of the book provide innumerable Internet resources for further study. While I purchased the print version from Amazon.com, I would recommend a digital copy to get the full and immediate effect of these online resources. From the very first chapter, I learned something new. Her Surname Origins chapter provided me information about Lay Subsidies that helped me develop a new theory concerning my own surname’s source, as I was able to find similar names in the areas where my name had ramified. I am currently doing additional research regarding this theory. While she draws from her own research and the Cruwys ONS, she does not limit her illustrations to her own experiences. Aptly, Debbie incorporates examples from others’ research in tracing a surname. In her final chapter, she provides an in-depth case study of her own ONS. I find it helpful to envision what others have accomplished in determining what may contribute to my own research. The biggest surprise was that Debbie began her own ONS in 2002. From the depth of her knowledge and her constant and helpful advice, both inside and outside this work, I would have assumed that she had been researching surnames for several decades. Her writing exudes her passion for surname research. With this book, you will gain practical knowledge of the following: the development of surnames, the differences between surname variants and deviants, how to map your surname and compute its frequency, where to research the surname in the medieval period, how to conduct a related DNA study, and how to proceed with a one-name study. If you are considering studying a particular surname – especially if that surname originated in the British Isles, you would be remiss by not having this important volume as part of your library. I highly recommend The Surnames Handbook: A Guide to Family Name Research in the 21st Century. This book is useless for anyone wishing to trace a surname that is not common to northern Europe in general and the British isles in particular. While the subject matters deals primarily with the British Isles -- and is most helpful for this region of the world, there are general principles that can be applied to any surname study. Perhaps it can then serve as model for those other countries in Europe to develop something similar for their own country. I am sure Debbie did not set out to write a pan-European surnames book. Almost certainly that would be a multi-author mammoth tome to come anywhere close to the standard set here, and with a price tag to reflect that.